Commonwealth alumni returning to Bangladesh should aim to contribute as much as they can to their local communities. This was the clear message from Dr Shirin Sharmin Chaudhury, Speaker of the Bangladesh Parliament – and a former Commonwealth Scholar herself – at a reception last week. The reception, held to welcome home recently returned Commonwealth Scholars, was hosted by the British High Commissioner to Bangladesh, H.E Alison Blake. 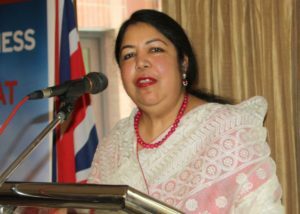 Also in attendance was Alok Sharma MP, UK Minister for Asia and the Pacific, who was in Bangladesh on an official visit. Mr Sharma expressed his delight at meeting so many Commonwealth alumni, and emphasised the UK’s continuing commitment towards building a stronger relationship with Bangladesh. In addition to networking with each other and invited guests, including representatives from DFID Bangladesh and British Council Bangladesh, alumni were reminded of the opportunities available to them and the importance of keeping in contact with fellow alumni and the CSC.